What a weekend. I won't go into too much detail since it's too depressing of a thought but I had to work both days this past weekend. While that's not such a terrible thing in the grand scheme of things, I LIVE for the weekends so it was a pretty tough blow to deal with. Anyways, after working on Sunday, I decided I needed to do something that would pick-me-up. And yes, retail therapy is what I'm talking about. I wanted to get more picture frames, so I thought the best places to find inexpensive (and fun) ones would be at TJ Maxx, Marshall's, and HomeGoods. Yes, I really went to all 3 yesterday after work - I told you I needed a pick-me-up. Well, at my final destination (HomeGoods), I picked up a few frames and while walking over to the bedding section I noticed this fabulous upholstered stool. My shopping instincts took over and I immediately snatched it up without thinking whether or not it was an item on our priority list. It was just too good to let go, so after calling my husband (with the sweetest voice possible) to convince him how much we needed this unique find, I brought it home. 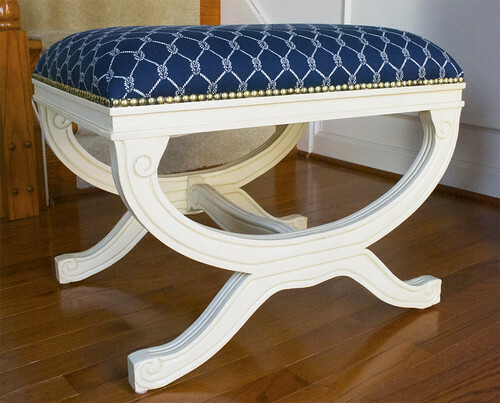 Everything about this stool won me over. 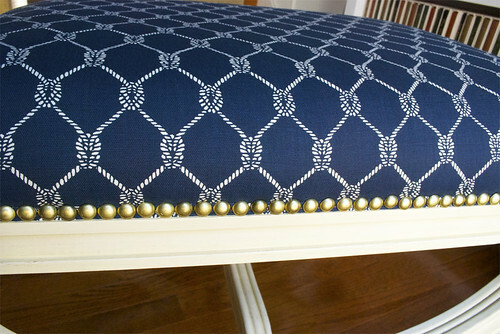 The fact that it's upholstered is a plus, and then to have it in this amazing nautical print is just icing on the cake. Ooh, and don't get me started on the nail-heads. That alone would've made me bring it home. But seriously, if you ever come across a find like this, don't hesitate, cause the next person to come across it won't. What do you guys think about it? I love it! Where did you put it? @Kathysue - I know! I was scouring the store to see if there was a matching pair, but alas no such luck. My husband said the exact same thing, that it was a shame that there weren't two so that we could put it at the foot of our bed. You have a great Monday too! @Eileen - Thank you! I originally wanted to put it in the guest room, but Steve liked it so much that he wanted it in the living room in between the blue secretary and the tv stand. You've got to come over to check it out! Absolutely adore everything about it, the color and print- it looks like a special piece, the one guests ask you about. There isnt a Homegoods close to me and I think I've only been to one very empty and sad looking one, yet everytime I turn around, someone is finding great stuff. I'm going to have to make another trip real soon. OMG! I just noticed this! It makes me want to get in the car and drive to Homegoods right now, even though I know my chances are slim...how much? @Mary Ellen - Haha! I know, right?? I always have to tell myself that I can only go there if I really need something, because I keep making impulse purchases. If I remember correctly, this set me back $120. 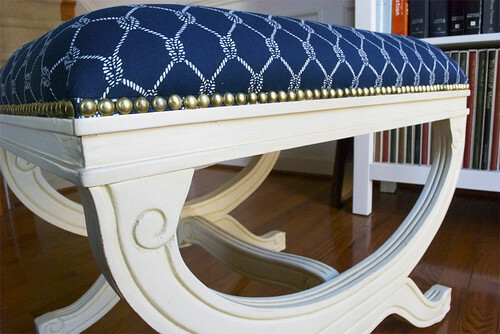 They still have a lot of these upholstered stools so go see if they have any more. Great seeing you this past weekend!! !